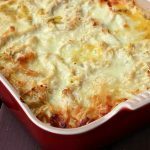 Craving creamy chicken lasagna? Use spaghetti squash instead of pasta. Preheat oven on 375°F. Carefully cut squash in half lengthwise and remove seeds and strings. Line a baking sheet with parchment paper. Put squash, flesh side down, on baking sheet. Bake until fork easily pierces flesh, about 40 minutes. Cool until easy to hold. In a large saucepan, heat olive oil over medium heat. Sauté onion, green pepper, red pepper, and garlic until onion is soft and translucent. Add soup, milk, and basil and reduce heat to low. Cook, stirring occasionally, until sauce is smooth. In a small bowl, combine cottage cheese and eggs. Stir until eggs are well-incorporated. Spray a 13- x 9-inch baking dish with cooking spray. Scrape half of squash into baking dish and distribute evenly. Cover with half of sauce, half of cottage cheese mixture, half of chicken, half of mozzarella, and half of Parmesan. Repeat layers. Watching sodium? Use low-sodium cream of chicken soup. Almost all of the sodium in the recipe comes from the soup. Watching fat? Use low-fat or nonfat cottage cheese and milk. You could also cut back on the amount of mozzarella and parmesan cheeses and use an egg substitute instead of whole eggs.